If you intend to regularly add or change the content on your website then you don’t want to have to learn HTML, CSS and FTP or pay a web developer to simply add a new image or change a phone number on your website. That is where a Content Management System comes into it’s own. A Content Management System (CMS) can make updating your website a piece of cake. Instead of outsourcing updates and changes to your website a Content Management System or CMS allows you to edit your website without the need for any technical knowledge. 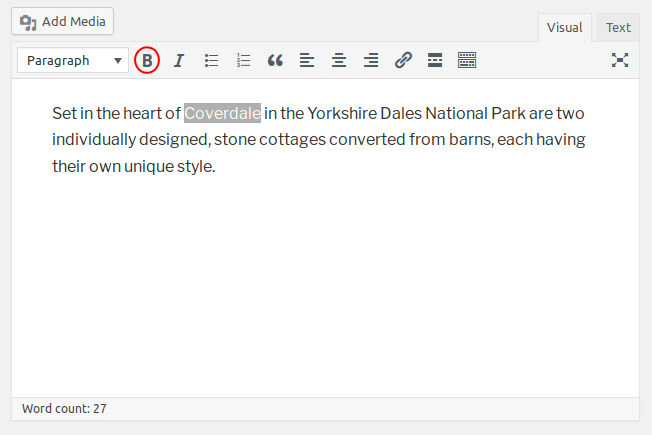 Content Management Systems, such as WordPress, Joomla or Perch, allow you to add, edit, organise and publish content on your website. Do you need to add a new page, write news stories and blog posts, add products or services? A Content Management System has you covered. There is no need to understand how HTML and CSS works to align that new image or add a link to a new page. A couple of clicks in the CMS does everything for you. Need to make that text bold? Highlight it and click B. Simple as that! A good, well documented, Content Management System allows you to edit your website with as much ease as writing a document using Microsoft Word. Like what you’ve heard so far & want to discuss your Web Design project? Give us a call today on 0800 007 5013, Email Us or complete our Web Design Quote Form. Designed in Durham with love, loud music, coffee and cake.